Apart from providing reporting and alerting through email, the backup solution should also provide the options to restore individual items such as restoring a single item e.g. an email or database from Exchange and SQL Servers. You should also look for a backup product which is flexible enough to store the backup copies at an off-site location so you can restore the business continuity in case a disaster strikes at the production site. Since most of the backup solutions fail to provide all capabilities in one product, I really liked Vembu BDR since it provides all these capabilities in one product. 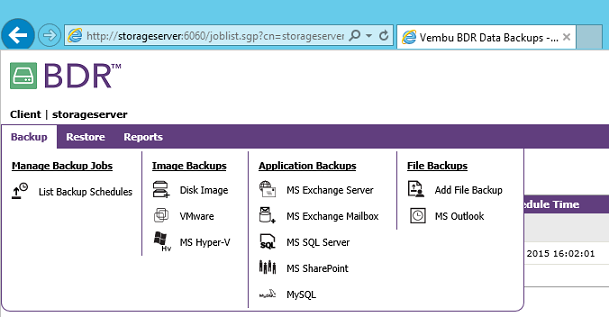 Vembu BDR is an affordable and easy to use backup solution that not only helps you backup file servers, Exchange and SQL Servers, disk as images but also provides you an easy to use, menu driven web interface, which can be accessed from any other computer on the network. If you are looking for a small to midsized backup solution, Vembu BDR seems to be the perfect choice. While other options might be more suitable for larger environments, Vembu BDR can still be deployed if planned appropriately. Vembu BDR is simple to install on Windows computers. I did not have to spend much time to get it up and running. The product ships with two components; Vembu BDR Server and Vembu BDR Client. Vembu BDR Server component is responsible for keeping the backup copies, provides the central reporting and helps in initiating the restores. The Vembu BDR Client component is used to configure the backup schedules on the destination servers. It also performs the backup as per the backup schedules defined and then stores the backup copies on the Vembu BDR Server. It is important to understand that you would require a working Internet connection to install the Vembu BDR Server and Client components. The good thing about installing the product from the Internet is that you will always be pulling the latest libraries from the Vembu storage hosted at Amazon S3. Another good thing about Vembu BDR is that it ships with its own database that is configured automatically during the installation whereas most of the backup products require a database to be prepared before the product can be installed. I installed Vembu BDR Server component on a Windows Server 2012 R2 with 8 GB of RAM. The first time you open Vembu BDR Server Web Console, you will be required to enter the login credentials, set the time zone and disk configuration for storing the backups. These are the minimum tasks you need to perform on the Vembu BDR Server so clients running Vembu BDR Client can communicate to Vembu BDR Server and store the backup copies. A very good thing about Vembu BDR is that it uses the next available disks configured for storing the backup data if the current disk runs out of space! This is one of the several great features of Vembu BDR. As to installing Vembu BDR Clients on servers, all you need to do is to install Vembu BDR Client on the target server. 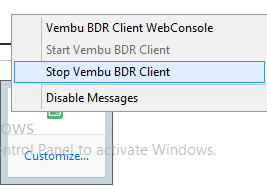 After installing, just click on the Vembu BDR Client desktop shortcut, connect to Vembu BDR Server and then create the backup schedules. Additionally I was curious to know if I could manage a server from any other computer on the network. Since both the Vembu BDR Server and Client use https protocol, you can access them from any other computer on the network. 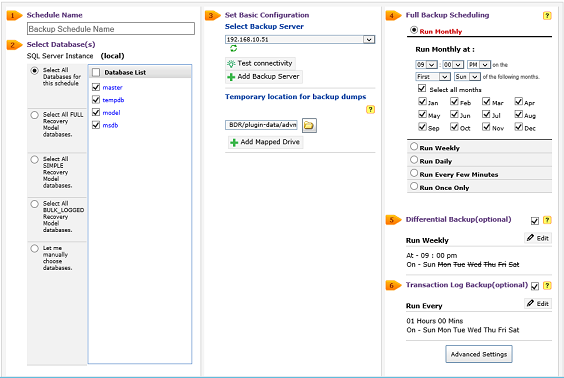 The backup options are available for you to select through the Vembu BDR Client web interface as shown in the screenshot below. 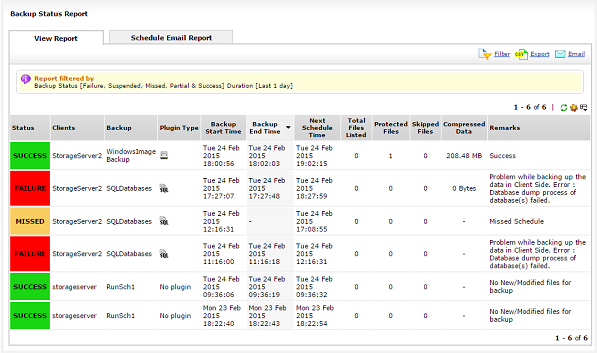 Another good thing about Vembu BDR is that it provides you with the steps necessary to proceed with a task. 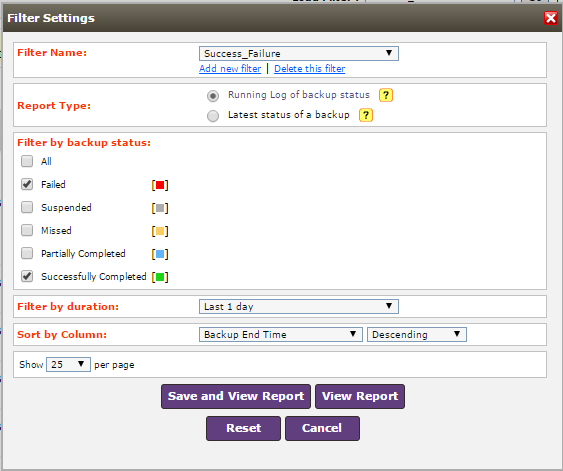 As you can see in the screenshot above, when creating a backup schedule for Disk Image, it provides you with the necessary steps to create a successful backup schedule. In Step 1, you provide the name of the backup schedule. 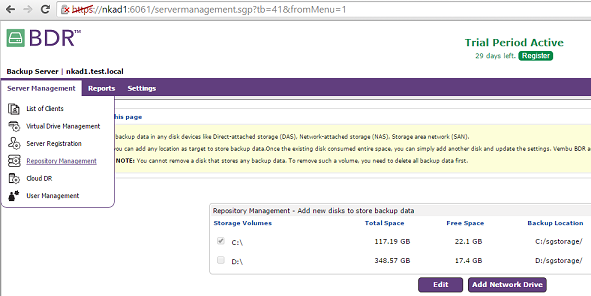 Step 2 asks you to select the list of disks that are going to be part of this backup schedule. 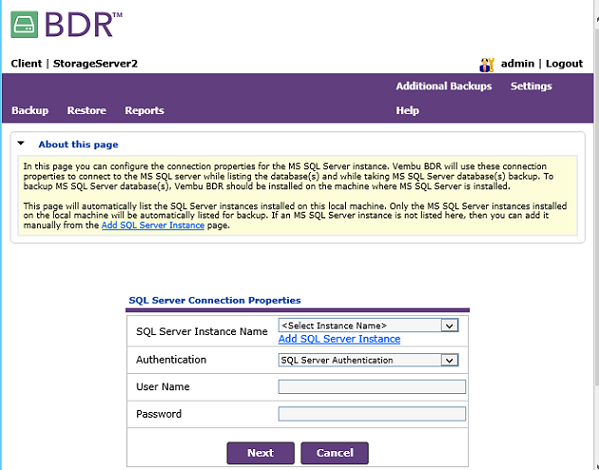 Step 3 is to select the Vembu BDR Server. Step 4 is to define the schedule. 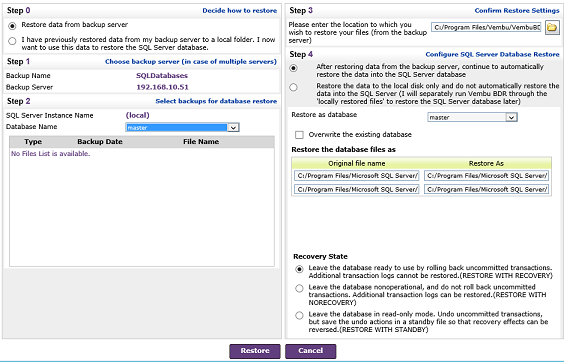 Step 5 allows you to define the retention policies for this particular backup schedule and Step 6 provides advanced backup options. 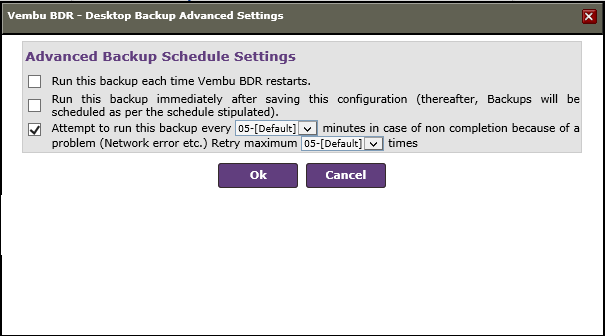 As to retention policy at Step 5, Vembu BDR provides the backup retention policy for both current day and week. Retention policy for the current day is very useful for servers that frequently update the data in order to keep multiple backup copies per day. 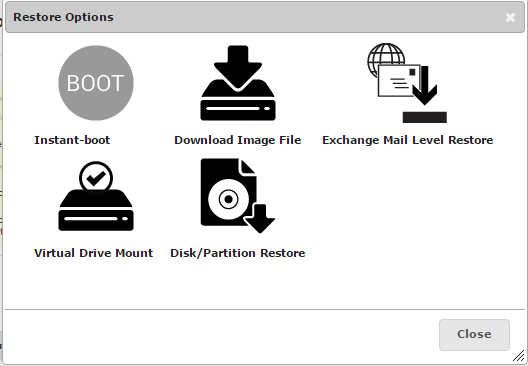 Booting from a backed up image is advantageous when you want to restore the business services as quickly as possible. As stated earlier, a backup solution should also provide backup and restore support for enterprise applications such as SQL and Exchange. 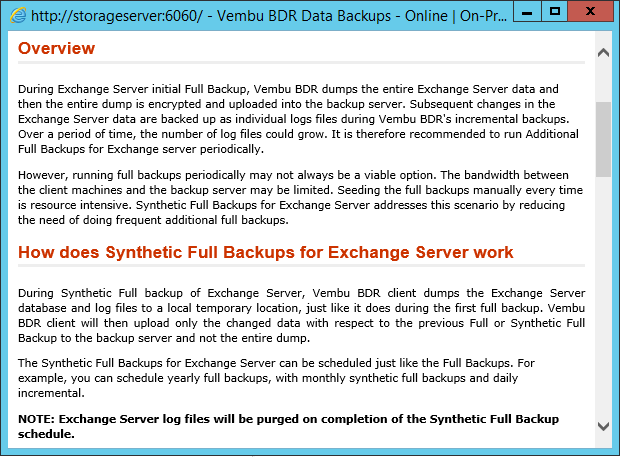 Vembu BDR does a very good job in backing up SQL and Exchange server databases. It is because Vembu BDR provides you with the ability to select the SQL databases you want to backup and then using the flexible Vembu BDR Web console you can restore the databases to the same or an alternate computer. Backing up SQL Server is very similar to backing up Disk Image except you are required to add the SQL Databases you want to backup. You would also need to make sure that you have added the SQL Server instances before creating a backup schedule for the SQL Server. 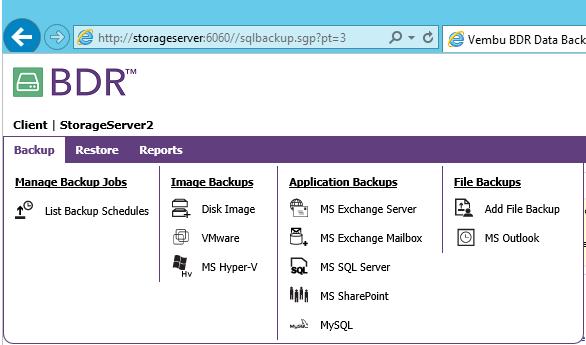 It is not necessarily true that you need to log on to the SQL Server computer to create the backup schedule. As long as Vembu BDR Client is installed and working on the SQL Server, you can also launch Vembu BDR Client web interface from another computer using IE or similar browser. In case you need to include databases of your choice, you can select “Let me manually choose databases” option and then put a checkmark in front of the database. 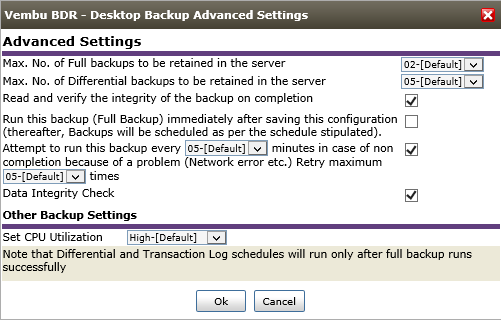 Apart from selecting the Full Backups, you can also choose to enable Incremental backups as shown in the screenshot above. Apart from providing the necessary steps Vembu BDR also provides necessary help for any given option. At any point in time, if you need to know more about an option, just click the yellow “?” icon shown in front of the step. For SQL Server backup schedules, Vembu BDR Client would require a temporary location to store the backed up data before transferring these backup copies to Vembu BDR Server. This is a good practice for a backup product. 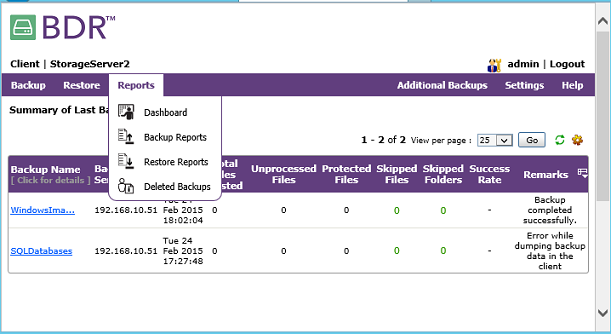 Vembu BDR Client is ensuring that it wraps up the backup copies locally by verifying the integrity of the backup (if you selected “Read and Verify the Integrity of the backup on completion” option as shown in the screenshot above). and then storing the backup copies at the Vembu BDR Server. This ensures that Vembu BDR Client is storing the consistent and verified backup copies at Vembu BDR Server. As for Exchange Server restore, you can either perform Exchange Server restore from Vembu BDR Server or Client. 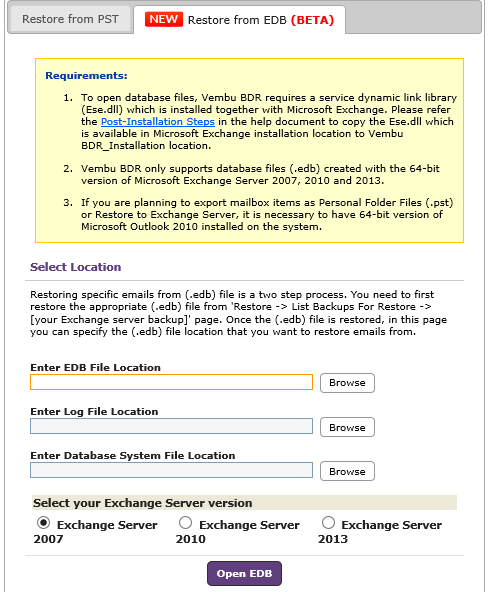 To restore a single item or mail from the Exchange database, you would be required to install the Exchange MailBox Plugin from the Vembu BDR Client installation directory. Depending on the version of the Exchange Server you are running, you would need to follow the steps from the Vembu BDR documentation. For Exchange Server 2007/2010/2013, you would need to run AddPermissionForMailBox.bat file as shown in the screenshot below. Let's assume that after setting up a backup schedule for Exchange Server, you get a call from your CIO that somehow he/she deleted a couple of important emails. Vembu BDR allows you to restore specific email items either by restoring from a PST file or restoring from EDB file. 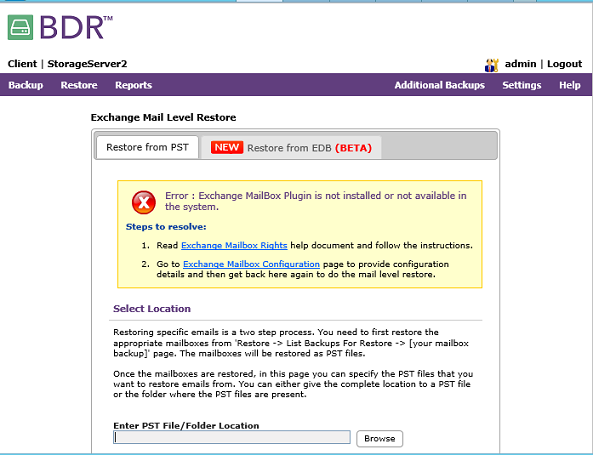 Before you can restore specific emails from the PST file, you would be required to restore the user mailbox to an alternate location. Once done, provide the location of the restored PST file/folder and then restore the individual emails. Before you can proceed with restoring specific email items using “Restore from EDB” option, you need to have a couple of requirements in place as shown in “Requirements” section of the screenshot below. 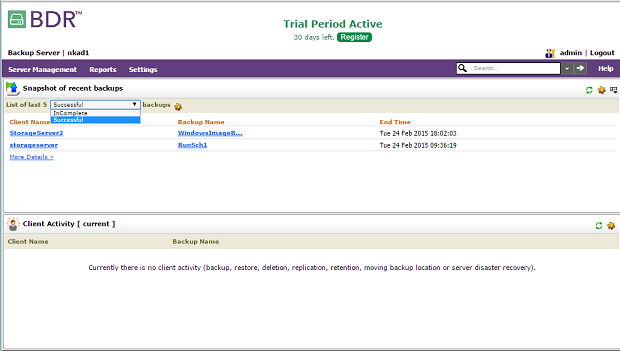 You can also select to show you the “Successful” or “Incomplete” backups. While the Server Dashboard shows you the backup reports for all servers, the Backup Status Report sub-menu located in the “Reports” menu shows the status of each backup from all clients Vembu BDR Server has processed as shown in the figure below. Once you have created the filter, all you need to do is select the filter from the list and then process the filter to show you the status of the backup. This not only helps to find the issues with the Windows Image, SQL and Exchange Server backups quickly, but it also allows to save time by filtering the failure and success backups with a few clicks. I have heard from different sources that the response time on support from Vembu BDR is fantastic. All queries are addressed within 15 minutes and all technicians are knowledgeable about the product. Vembu BDR product is a very cost effective solution. By default, users get a trial period of one month. After that, BDR users need to login/sign up to Vembu Portal, register and update their payment information. 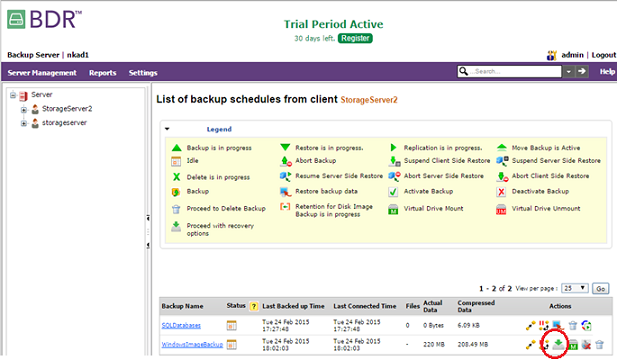 Once the backups are processed, the users will be charged by the end of that particular month. You can check on buying options here: https://www.vembu.com/buy. Considering the high-end backup features included in the product I think the price is very reasonable. 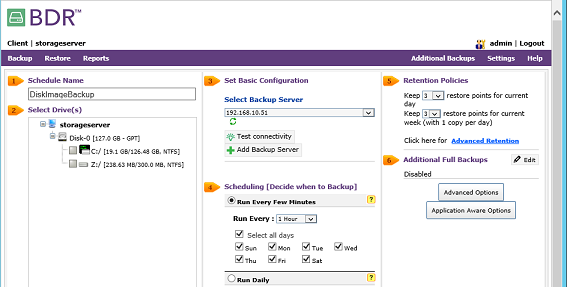 Vembu BDR is a great backup solution providing a lot of good backup options at a reasonable price. I was pleased to see that it includes such great features as creating multiple backup schedules, support for different application backups, restoring individual mail items, configuring multiple backup servers per client, and so on. I liked the product, as it was very easy to setup and more than easy to identify the issues using Vembu BDR reporting at both server and client level. Furthermore there are many different types of backup supported by Vembu BDR. It was really easy to process the restore of an important item from the client side rather than opening the web interface at the server side. 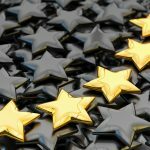 I would recommend this product as an affordable and feature-rich backup solution and I’ve given it WindowsNetworking.com Gold Award with a rating of 4.9 out of 5. Learn more about Vembu BDR or request a free Demo.